When is it the right time to hire a Product Designer? In his latest story, Billy Kiely (VP Product Design at InVision) said that “for the companies disrupting the market today, design is no longer just a “stage” in the business process, it is the language of business!”. I couldn’t agree more with him. Design is not just a department anymore. Indeed, customers increasingly expect products and services that are designed to meet their needs, delight them with unexpectedly great experiences, and address a heightened sense of aesthetics. Even if it sounds like a basic and logical statement, any startup which wants to succeed should keep these few words in mind before launching their product or service and after, while growing their business. Business, Technology & Design need to be aligned to ensure that you are building sustainable products. More than making your product and service visually attractive (although this is also important), a great user experience helps you to solve the needs of your customers (e.g. when the promise doesn’t match the product, customers feel deceived) and to make sure they will enjoy the full experience. It’s something you want to take care of from day-one, and that’s why you should hire a product designer as soon as possible 😉 The Sooner The Better! 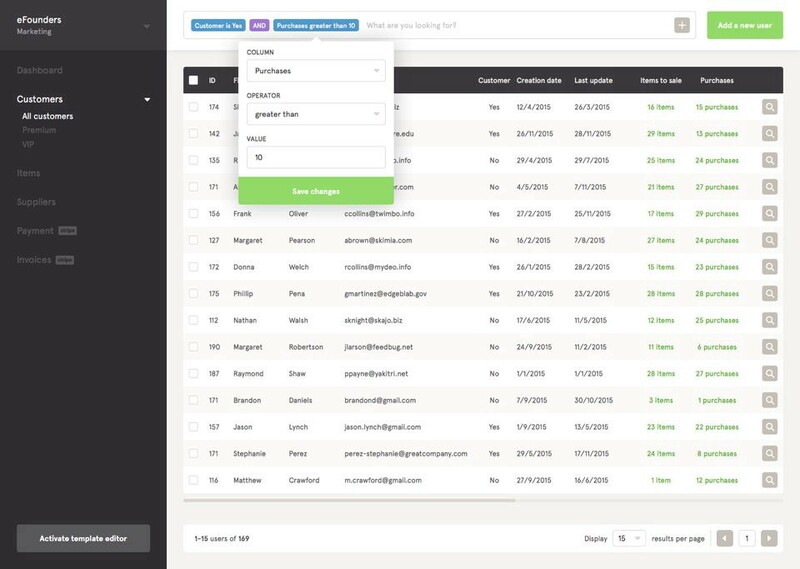 Forest, the 1st admin interface as-a-Service, was officially launched last year within the eFounders startup studio. Its multi-disciplinary team works hands-on to build a strong product with the team. Special mention to Didier Forest who worked as Product Designer on the project at the beginning. He crafted and created a cool universe for the brand and a coherent UX/UI for the product. In no time, with the company growth, product needs (design and tech mainly) started to be more and more important every week. Between new features design and optimization of existing ones, we needed Didier full-time. Unfortunately for us, it was impossible due to the eFounders’ organization and a several new projects being launched at the same time such as Spendesk, Station, Slite… to mention just a few. In most of the cases, the product lives with its own time, sometimes following directions you didn’t previously think of or anticipate while answering customer’s requirements. At some point, you start losing consistency as you grow fast without always knowing what comes next. So does the design, leaving the product with a non-optimal UX. It is the reason why by then, it was time for Forest to get a full-time Product Designer onboard. The timing was perfect because, at this moment, I was looking for a new experience. I had previously worked for startups, creative agencies and bigger international groups, always getting more and more experience and focus on digital product design. Lucky me, I already knew eFounders and got the notification of the open job position. 5 interviews later, I was hired 🎉 The beginning of a great adventure! Trying to solve other companies needs (Forest ones too, at the same time) and helping them to reach higher operational efficiency through a unique, yet customizable, admin interface is a complex project. Consequently, the product we are designing and developing is complex — well, like almost any others! Second — Needs, requests and feedback from our customers with which they can improve their operational process. But Forest is not only a product or a bunch of trees to me. It’s an awesome team of 10+ lumberjacks (and counting) I have the chance to work with. Among them, I closely collaborate with Louis Steenbrink and Arnaud Besnieron a daily basis. Louis as Customer Success owns the problem. Arnaud, Tech Lead, and I we own the two sides of the solution i.e. the technical execution and the visual interface. From my side, it is all about finding a solution, avoiding (or killing) inconsistencies, building a better experience and using space as its best in a full of data architecture. I would love to share with you more details about my missions at Forest as a Product Designer but I feel like I deviate from the original question of this post. This Medium article is one in a series on design I will contribute to in the future so pretty sure you will hear from me soon… stay tuned! Business, Technology & Design need to be aligned to ensure that you are building sustainable products. Therefore, you should hire a Product Design as soon as you can and (please 🙏) never make compromises on design! Remember that Design is the language of business, not just a department!